As a Sega Genesis gamer, do you care about stretched aspect ratio? Thread: As a Sega Genesis gamer, do you care about stretched aspect ratio? The games were intended to be played in 4:3, and in 4:3 I play them. Yes, but as addressed earlier in the thread, in many cases (especially SNES) game art was NOT drawn for 4:3. Thus, the question. CkRtech, thank you for your latest aspect ratio vid, on the CPS-1. Knights of the Round is another one of those 384x224 CPS-1 games. It always used to confuse me when starting the game in MAME as to why it was widescreen. From browsing Youtube Let's Plays, it seems that many people still run it in square pixels, despite it clearly being designed for 4:3. Knights of the Round is another one of those 384x224 CPS-1 games. Most emulators defaulting to square pixels because of all the people obsessed with "must be the sharpest pixels ever ow my eye" at the expense of correct aspect ratio probably isn't helping the case (nor the fact that non-filtered images stretched up look awful for anything that isn't an integer ratio). Honestly I don't mind using bilinear filtering because honestly pixels weren't square on a CRT either (in fact, dots had a tendency to look… quite round). EDIT: disclaimer, for screenshots having the raw image with only integer scaling is actually useful (as sometimes you want to analyze the pixels or rip a sprite out of them). Now after MLIG and retroRGB show, people are crazier about PVM/BVM spending some fortune for their hundred of lines to play SD content thats runs at 240p at 15khz. its funny because these insane number of lines is not how these games is idealize to show on arcades or in development area, its looks like a emulator image on CRT. The advantage that is "noob" safe, you don't have to know how calibrate or regulate your setup, is just plug and play. Even if the art was not drawn IN 4:3, most TVs at the time were 4:3 and any developer worth their salt made sure that the art is drawn FOR 4:3. On SNES it could be achieved by drawing the art somewhat thinner than it should be so it would be stretched to its proper size on a 4:3 screen. People don't realize or don't give enough credit to how much the technical limitations of the monitors affect game art and how the games were intended. I mean, one CAN, of course, play 16 bit games in the internal SNES aspect ratio without smoothing the pixels and without accounting for the difference in contrast and saturation between CRT and modern displays, but it just won't be the experience devs intended. Everything would be off. Saying that doesn't make it a reality, unfortunately. As has already been mentioned (watch OP's videos), many, if not most, of the 256x224 console games did not have correctly adjusted art for 4:3. Proportions are definitely wrong at 4:3. Look at the misshapen circle of the tunnel hole and the squares of the wall/floor. Are any designed with 4:3 in mind? On the Genesis, it's entirely possible that designers weren't aware that the game was going to be 256x224, or just didn't have the know-how or care to factor it in. Regardless, most of the Genesis's 256x224 games did NOT have their art correctly adjusted for 4:3. Capcom, on the other hand, was clearly on top of things with the CPS games. Is curious because almost all nintendo games to SNES the artwork is drawed worng, also 98% of third parties developers did it worng too.. including Capcom. Also a litle time ago most of sega fans with great youtube channels don't know about low res and complain about screen be squezed in comparison of the original snes / pce games, the most common games is Devils Crash, Zombies ATN and others thats have side status bar. Also when the game runs in low res on snes and in hi res on MD they talk as the snes sprites are bigger than md . My friends talks that is the power of the snes to make the things bigger on the screen and etc..
for kids its alright but to growth man who tries show some information over internet.. no! 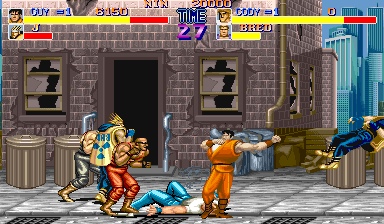 Yeah Final Fight is probably the game I played the most at the arcades and I remember feeling something was off when I played the SNES version even if I couldn't quite grasp what was the problem. I guess I never had a good eye for that kind of stuff. lol I'm glad I managed to stay away from console wars on the internet most of the time. But I guess it wasn't only kids back then. The whole character size thing was big on Brazilian video game magazines when comparing ports and without any mention to screen resolution or loss of details that I can remember. Right. I imagine they were just going for "good enough" and didn't want to sacrifice the time it would take to draw everything distorted by a certain amount. There's also the possibility that some graphics were drawn with 4:3 in mind, while others weren't. That's why, as CkRtech says, the circle test should not always be the defining test. For example, designers might have drawn character sprites on the skinnier side knowing they would be distorted, while background artists might not have taken 4:3 into account. Also anything rectangular likely has no hope because those graphics are usually designed to be aligned to tile boundaries (and the tiles are not square), so those probably shouldn't be considered when determining that (unlike circular shapes). EDIT: reminds me, yesterday I was reading some Japanese magazine from 1992 and at some point it talks about Final Fight CD and they spend a good chunk of the space to taking a jab at the SNES version lacking Guy, a whole stage and 2P mode (all of which are present in the Sega CD version). Including a screenshot showing all three things at the same time (Guy in the missing stage, and the 2P HUD bar is visible). EDIT: on that note, Final Fight SNES doesn't compress graphics at all if I recall correctly? (it was an early SNES game after all but… jeez) That's likely why they ended up removing Guy and that stage (no comments on lack of 2P). I wouldn't be surprised of Poison missing was also in part due to this, rather than just Nintendo's policies. I wouldn't be surprised of Poison missing was also in part due to this, rather than just Nintendo's policies. No, because she's in the Japanese version. Besides, it's not like she was simply removed from the English releases, she was replaced by a character that probably takes about as much space.